In 1974, while living and working in Nashville, Tennessee, I began collecting political buttons. Two years later, as a volunteer on Jimmy Carter’s presidential campaign, my hobby moved into overdrive. In 1976, I joined American Political Items Collectors (www.apic.us), which promotes the preservation and study of campaign memorabilia. We have a diverse membership that includes historians, teachers, elected officials, political enthusiasts and hobby nerds! APIC sponsors shows where members buy, sell and trade items; publishes a quarterly magazine, The Keynoter; supports archival projects; and works to protect the hobby from fakes and reproductions (APIC was instrumental in passing The Hobby Protection Act, signed by President Nixon in 1973). In June 2017, I got excited when I saw dozens of people wearing APIC badges outside the Oregon Convention Center. Turned out, it was the 44th Annual Conference of the Association for Professionals in Infection Control and Epidemiology. Why they use “APIC” instead of “APICE” is beyond me. American Political Items Collectors was formed in 1945, long before these infection infringers got together. Maybe we need Nixon to come back and protect our hobby. In the ’70s, I picked up buttons at campaign headquarters (they were free then), antique shops, flea markets and congressional offices. I remember walking into the Capitol in Washington (no security), and going door-to-door. Assistants and secretaries always managed to find me buttons or other campaign materials. I did the Dirksen Senate Office Building and the Rayburn House Office Building, too. On one of those runs, I ran into Senator Ted Kennedy in the hallway. He chatted me up and was intrigued that I was a collector! He might be pleased to know that I now have 170 of his campaign pins. And counting. In September 1996, I was playing a comedy club in Overland Park, KS. I drove to Topeka to tour the capitol building and hunt buttons. I walked into the governor’s office and the only person there was an assistant (or secretary) who was at her desk, knitting. It was a slow day in Kansas – or maybe a busy one. I almost asked if I could run the state for 30 minutes, but thought better of it. She was very nice, but said there were no pins for Governor Graves in the office. I asked her if she knew the address of the Republican headquarters; she told me immediately. Then I asked, “Where is the Democratic headquarters?” She looked puzzled. “Well,” she said after a good pause, “I don’t know if we have one!” She got out the phone book, and we looked it up together. It was a tiny space in an alley that wasn’t even open. I came up with zero buttons on that trip, but at least I got in and out of town without running into the Westboro Baptist crazies. Of course, the APIC roster provides me with trading partners throughout the country. And my sources have now expanded to include eBay, hobby Facebook pages, and online auctions. Most APIC members are interested only in presidential buttons, and, among those, are specialists that collect only winning candidates or pre-1980 pins or third party nominees or whatever. Others concentrate on “locals” (governor, senator, mayor, etc.). Some collect “cause” buttons (World War II, labor, civil rights). Still others seek only “paper” – campaign posters, broadsides, convention tickets and the like. I collect ALL BUTTONS! But locals are clearly my favorite. They account for about half of my 20,000+ pins. My top 12 states are: New York (840), California (685), Oregon (602), Pennsylvania (589), Illinois (510), Minnesota (378), Tennessee (309), Connecticut (288), Colorado (275), Massachusetts (270), New Jersey (267), and Indiana (264). The value of a local button can go way up as history runs its course. A “Hubert Humphrey for Mayor” of Minneapolis fetches a good price. After Jimmy Carter was elected president, his 1966 and 1970 gubernatorial buttons soared from 50 cents to 30 bucks. Obama Senate pins sell regularly for $60 to $80. Completing a set of all 38 members of the House Judiciary Committee during Watergate is a common hobby quest. Being on radio for 10 years was a boon for my avocation. It was an unwritten rule that candidates who came in for interviews had to bring along their offerings. Also, my loyal and generous listeners sent me plenty of buttons. It has, however, become increasingly difficult for friends to find items I do not have. Kent Mathews kept gifting me buttons I already owned. So he spent some decent cash to buy me a treasured “Harvey Milk.” Thank you, Kent, for your persistence! My collection is displayed on high-quality cotton canvases. The result is a kind of pop art! Ultimately, there will be more than 600 boards. To date, I have completed 238. Every presidential candidate – nominees, also-rans, third-party hopefuls – has his or her own board. I am in the process of creating canvases for my locals collection. Each state will have four, 48” x 48” canvases: one each for governor, Senate, House and mayor elections. My dream is to have Bill Gates or Paul Allen or Tom Steyer or another billionaire who loves history build the museum, buy my collection and hire me to curate it! Or to have a major university develop a history center on its campus (created by its architecture and design students and funded by wealthy alums) where the buttons would serve as a centerpiece. My collection is fully insured and stored in a secure location. In 2013, it was appraised at $626,472. Senator James A. Reed (1911-1929) is the reason Missouri is the only state with two Federal Reserve Banks. On one day – March 16, 1905 – Colorado had three different governors! Alva Adams was one of them. The state’s 1904 election was one of the most corrupt in history, on both sides. Many older buttons have “back paper,” which is important to collectors. Two of the earliest manufacturers were Bastian Bros. of Rochester, NY, and Whitehead & Hoag, of Newark, NJ. One of 200 canvases displaying Carl’s collection of “locals.” This board contains Pennsylvania governor candidates. More have been added to this canvas since it was professionally photographed in 2014. Click on photo for larger image. 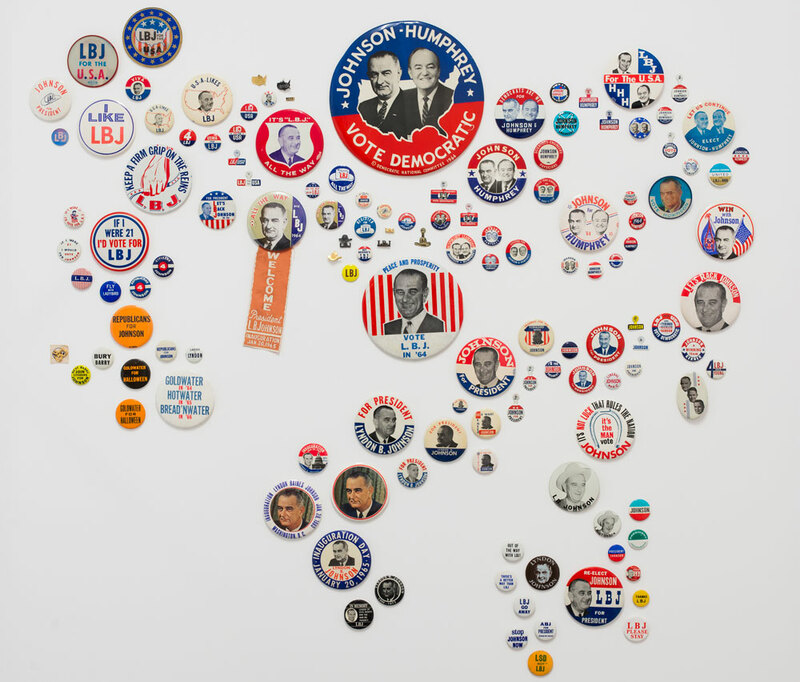 This collection of more than 20,000 campaign pins spans 121 years of American politics – from the introduction of celluloid buttons in 1896 to present day. 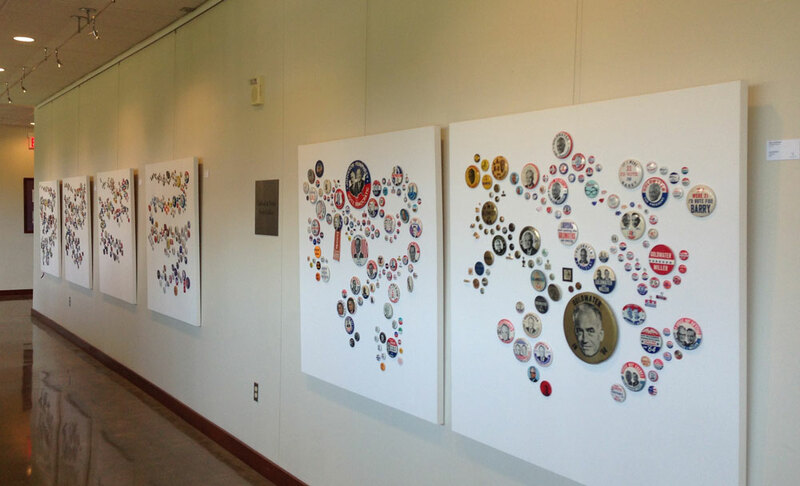 Republicans, Democrats, third party and independent candidates for president are displayed on individual canvases. Each state will have four 48” x 48” canvases, containing candidates for governor, U.S. Senate, U.S. House and mayor of the state’s largest city. Great causes – women’s suffrage, labor protections, civil rights, environmentalism, peace movements and more – are represented with separate boards. When complete, the number of canvases will exceed 600. My goal is to provide a historical archive that will promote interest in, and discussion of, our body politic. Behind each button there is a story of a candidate or cause. In turn, I hope viewers will connect and share their knowledge and recollections, providing an ongoing oral history of the American experience. Ultimately, I would like this collection to reside in a single museum, open to the public.